Thread: Please help. I don't know if our gecko Thunder is impacted. Where did you get Thunder from? How old is she and about how big is she? I ask because if she's an adult, she looks to me as if she has eggs in her belly. That doesn't mean they're fertile. If she is an adult, she will eat after she lays them. Get her a gladware container of coco fiber (you can get small blocks of it at the pet store which you then add water to) so she can dig and lay. We got her from a local pet store and we just know she is an adult. She is about 7- 8 inches long. We use reptile carpet. We just got hit with an snow/ice storm. We thought she was impacted so we did a lukewarm bat for about 10 minutes last night. I will get the Coco fiber this weekend. Should I allow her to eat the eggs? Our other gecko Lightning laid 2 eggs Sunday and we took them to the pet store. 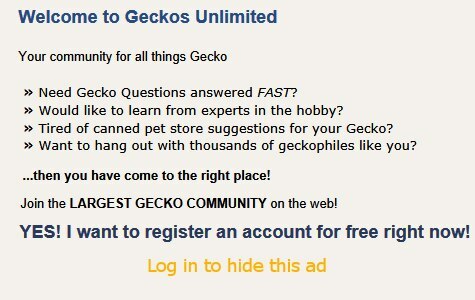 I've moved your thread from the African Fat-tailed gecko forum to the leopard gecko forum. Your gecko is a leopard gecko, which had completely different care requirements. You might want to re-check how you're caring for the gecko, to make sure everything is on par for a leopard instead of fat-tailed gecko, by starting a new thread in the leopard gecko husbandry forum. Do you know if she was kept with a male at the pet store? Those eggs look good! I'm wondering whether those temps are air or ground temps. Please adjust the temps as follows. Cool end ground temperature: 70ish-75 F (21.1-23.9 C) Usually the cool end ground temperature matches the room temperature where the enclosure sits. Leave the heat mat/UTH on 24/7. If you wish, during the night turn off overhead lighting/heating (~12 hours on and ~12 hours off) unless ambient room temperatures drop lower than 67ish*F (19.4*C).